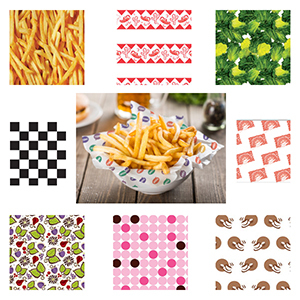 Whether it is stock prints or custom printed, we have waxed Food Grade Tissue paper available in popular sizes, several patterns and colors. The weight you need will depend upon the type of food you are serving. These range from heavy duty to light weight. If you don't see what you need please call us at 800-426-5708. Menu Tissue Paper is Light Weight 10.5# Paper, Full Wet Strength un-waxed for Sanitary pick up and or Food wrap, 12" x 12" sheets. Used for Dry Food Handling, Packaged in Dispenser Box, 10 packs of 1,000. 20# Grease Resistant Paper for Sanitary Food wrap. 18" x 20" sheets Packaged in Flat Poly Packs. 4 packs of 500 sheets, 2000 per case. Available in White.